Enter our FAB Giveaway – Win the Artyarns Florentine Kit in your favorite color! Color is everything – we know it, you know it – yet we can never predict what color is going to smash thru the screen barrier! We are always fascinated by why people have favorite colors – were you born loving ORANGE, or PURPLE – or is it an acquired love, the result of a college, a friend, a foe, a team. Our new giveaway features the Artyarns Florentine Kit! What you have to do: Post a comment here, or share the post using the buttons – (Facebook, twitter, google +): and in your share, tell us which color of the kit is your favorite (there are 7 options, after all!) and why. In your post, please link back to our website FLORENTINE KIT page – so everyone can see just what you are talking about! We’ll pick a random winner at the end of the contest (30 days) and Voila – the winner gets the kit of choice! One more beautiful design from ArtYarns! I always love ArtYarns yarn and patterns. It’s very difficult to choose just ONE favorite among these – but I’ll go with Carminio. The colors are so very rich, the photos I’ve seen look like red velvet. And my mother loved red – her kitchen was painted this very deep red, so this set of colors would always make me smile as it reminds me of my dear mother! Cool brenda – we may have to agree with you – it is SO AMAZING. I only wish I could knit as fast as IRIS! 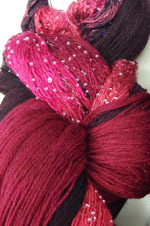 I totally love ArtYarns and have made 2 projects using these yarns. The color ways for this kit a very vibrant. I like the Carminio…but might prefer the colors in Jennifer. I love the nature look of these colors. All of those are absolutely beautiful! The viola coloring is my favorite, it reminds me of a blanket my grandma made me that has nearly felted in spots because I’ve used it so often. Such a lovely design! It’s hard to choose a favorite, but I think I’d have to go with Cielo! I forgot to share why I’d choose Cielo! Light blue colors are soothing and calming to me and make me feel happy! Artyarns have been on my knitting bucket list for far too long… They are true artists, combining color, texture, fiber content, in ways that truly inspire. In this instance the Cielo is my favorite, they are all stunning but I crave that beachy vibe of the blues and creams… Perfection :) Thanks for the chance to win!! Hi Michelle! You’ve WON – 1 cielo coming up – please let us know your shipping address so we can get this lovely kit out to you! Thanks again for entering! 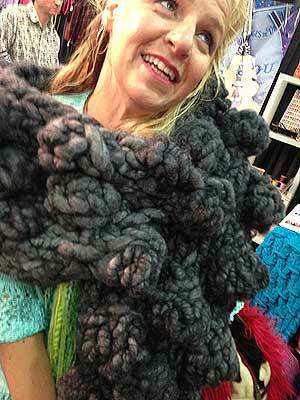 Art yarns makes the most beautiful yarn. The colors are so beautiful. I spent a long time trying to decide which color I liked the best. I usually like reds and purples. In this insurance, I had to pick Carminio. It is so gorgeous. Everyone would notice it, without it being too bright. Thanks for the wonderful contest. This would definitely be a go-to scarf! 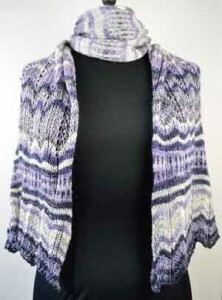 I love to knit with Artyarns.I love the Ensemble !!! The colors are beautiful and the softness.I pick the Cielo since it reminded me of Florence’s Duomo. Did this contest ever have a winner? It was supposed to be over July 16th, correct? oooh I love the cielo!!!!!!! Cielo is my favorite; the colors are so cool and summery. Reminds me of a day at the beach. Ohhhh…I am loving the Verdura or Carminio colorways!!! Such a fun giveaway opportunity…thank you…off to share…. I simply adore Artyarns fibers and colors. They create the most beautiful patterns as well. The Verdura colorway is simply perfect for fall, with an understated elegance truly befitting this line. This would be an awesome kit to win!! I rarely ever knit or crochet anything for myself. Filling requests, orders and charitable knits and crochets doesn’t leave much time for recreational projects. That being said, I rarely ever allow myself to fall in love with a yarn…but ladies and gents…I’m DROOLING! I can just picture a beautiful shawl, or wrap to wear when my husband and I go to the Reunion Ball next month with his U.S. Army unit from his Iraq deployment. The only problem I’m having is which one I like best! My eyes were first drawn to the Fiori, so I’m going to go with that as to not drag this on lol, but the Carmino and Azure are enchanting and so elegant!! As soon as I can sneak more yarn past the Hubbs I’ll be placing an order for sure!!! I would choose Verdura. Since I would be using this in the fall the colors are just perfect for the season. It was still a hard choice as all of these colorways are gorgeous! The Florentine Shawl is beautiful!! All the colorways are just gorgeous! I would choose the Carmino if I were to win. Previous story What an amazing color!